Ocean Energy’s cornerstone product is the OE Buoy. 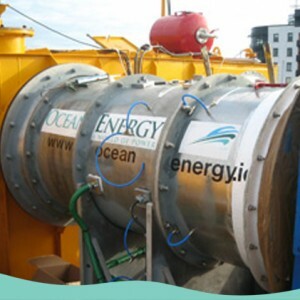 The OE Buoy is a wave power generation platform which is designed for survivability. The result of over 10 years of research and development is that the OE Buoy has only a single moving part and has just completed over 3 years of rigorous testing in Atlantic waters. To work in such a hostile environment the platform must be designed to extract energy from the waves efficiently and also survive the worst of ocean storms.